With a top speed of 322.3 km/h (200.3 mph) the BRABUS GLK V12 has set a new speed record for street-legal SUVs on the Italian high-speed test track on October 19th, 2009. The exclusive special model, powered by a twelve-cylinder twin turbo engine with 750 hp (740 bhp) / 552 kW, celebrates its world debut at the DUBAI INTERNATIONAL MOTOR SHOW. 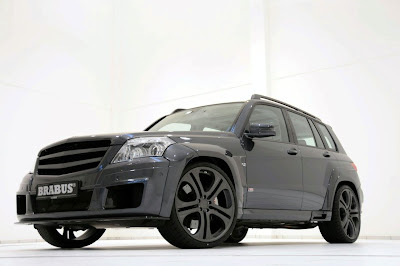 BRABUS builds this high-performance automobile based on the Mercedes GLK-Class. The BRABUS GLK V12 starts at 397,000 Euros MSRP.